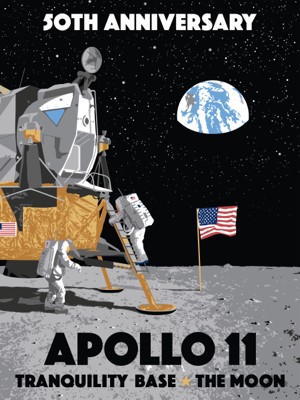 “Moonwalk,” a new Erick Sahler silkscreen edition celebrating Apollo 11, debuts in May. “Moonwalk,” a new silkscreen edition by Erick Sahler, celebrates the 50th anniversary of Apollo 11, the first mission to land men on the moon. The illustration depicts a scene following the July 20, 1969, landing. Commander Neil Armstrong stands on the stark surface of the moon as pilot Buzz Aldrin descends the ladder of the lunar module. In the background, the U.S. flag is planted firmly on the moon, and the “big blue marble” that is planet Earth glows in a star-filled sky. The 10-color silkscreen prints will be hand-pulled by the artist and will debut in May. The edition will be approximately 120 prints. The image is 12x16 on 16x20 paper. Each print will be signed and numbered. Prices are $105 unframed and $155 framed. They will be available in the shops that carry my work and on my website. “Jamaica Bay Festival” was commissioned by the Jamaica Bay-Rockaway Parks Conservancy. Thank you to Jamaica Bay-Rockaway Parks Conservancy for trusting me to create the poster for the 2019 Jamaica Bay Festival. The Conservancy partners with the National Park Service and the City of New York and is dedicated to improving 10,000 acres of public parkland throughout Jamaica Bay and the Rockaway peninsula. The festival, part of New York’s “City of Water Day,” will be held Saturday, July 13, from 10 a.m. to 4 p.m. in and around Rockaway Park, and will feature kayaking, surf casting, hiking, bird watching, and other arts- and nature-related events. Admission is free. 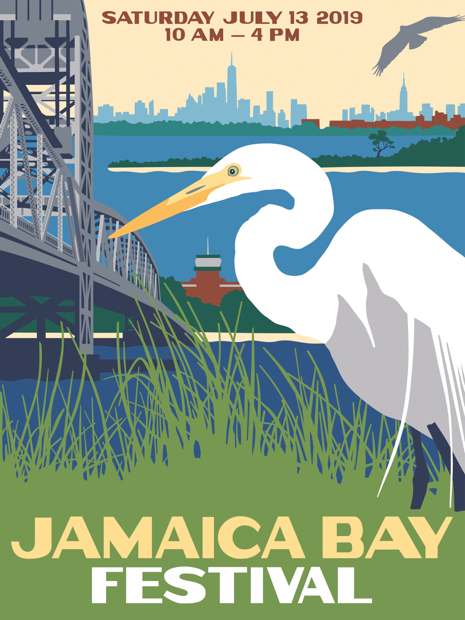 The illustration highlights a number of regional icons, including Igor the Egret, an osprey, the Marine Parkway Bridge, the Floyd Bennett Field control tower, the wild islands of Jamaica Bay, and the Manhattan skyline as seen from Rockaway Park. Sahler visited Jamaica Bay last summer to shoot reference photos. 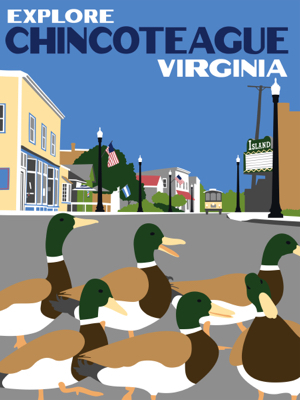 “Duck Crossing,” celebrating the wild streets of Chincoteague, debuts at Sundial Books in April. “Duck Crossing,” a new silkscreen edition by Erick Sahler, pays tribute to the happy-go-lucky flock of mallards that perpetually wanders downtown Chincoteague, Va. The whimsical illustration shows Chincoteague’s Main Street looking north, and includes such landmarks as Sundial Books and the Island Theater, as well as downtown’s iconic yellow trolley. In the foreground, six mallard ducks cross the street. One duck parodies illustrator Norman Rockwell, who painted himself into the corner of “Freedom from Want,” staring back at the viewer. The 12-color silkscreen prints will be hand-pulled by the artist and will debut in April. The edition will be approximately 100 prints. The image is 12x16 on 16x20 paper. Each print will be signed and numbered. Prices are $105 unframed and $155 framed. They will be available in the shops that carry my work and on my website. “Old Main,” a new silkscreen edition, debuts in September as part of a semester-long solo exhibit of Erick Sahler’s work at Franklin College. 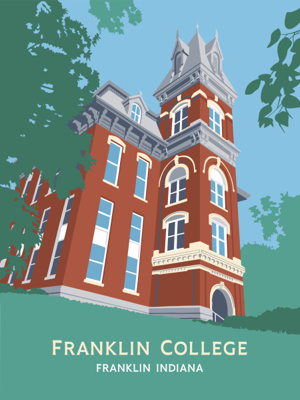 Old Main, the ghost-filled administration building that is the cornerstone of Franklin College, will be featured in a new silkscreen print edition debuting this fall as part of a semester-long exhibit of my work at the college. There will be 50 hand-pulled 10-color silkscreen prints in the edition. The image size is 12x16 on 16x20 paper. Each print will be signed and numbered. Prices are $105 unframed and $155 framed. They will be available in September on my website. On Sept. 17 at 7 p.m., Sahler will present “Things I Wish I Knew at Your Age” — a lecture highlighting his career and processes, as well as some of the wisdom he’s gathered along the way — in the Henderson Conference Room. A reception will follow. 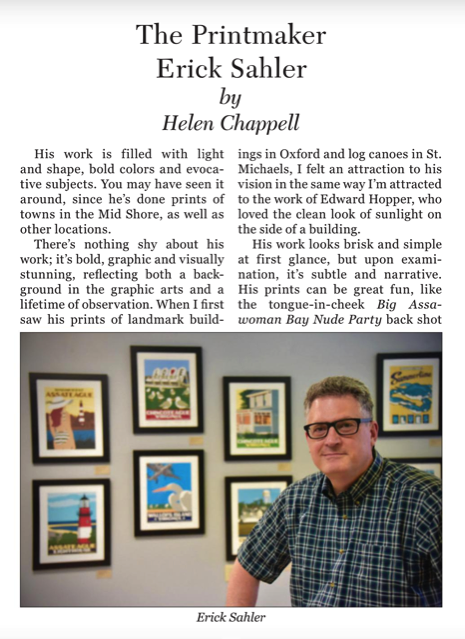 Many thanks to the legendary Helen Chappell, who profiled me in the February edition of Tidewater Times. Chappell is a larger-than-life character, a hard-boiled journalist and skillful storyteller molded in the style of H.L. Mencken and Mark Twain. She interviewed me from a corner booth in Oxford’s Robert Morris Inn, poking me about my life and work while seamlessly sharing nuggets of her storied life, including an art career in 1960s New York. It was terrifying and exciting. She’s a hoot. Chappell’s piece, “The Printmaker Erick Sahler,” flows from pages 9 to 24 and features eight images. Tidewater Times is like an Eastern Shore version of the New Yorker — sophisticated, yet understated, with great writing and an intense focus on the region it covers. It has been published since 1952. Eastern Shore writer Helen Chappell profiled Erick Sahler in the February edition of Tidewater Times. Vintage concert art by Globe Poster was exhibited in Cambridge, Md. 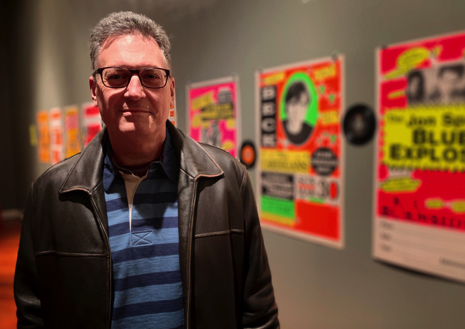 Globe at MICA — Anyone who grew up on the East Coast probably remembers the work of Globe Poster, the Baltimore-based printer that created thousands of Day-Glo posters that were stapled to telephone poles to advertise upcoming concerts. Globe’s heyday was in the 1960s, when it designed and printed posters for many rising acts, including James Brown, B.B. King and Tina Turner. Digital printing and municipal sign ordinances conspired to run Globe out of business in 2010, but its vast archive of posters and collection of letterpress type has been saved by Maryland Institute College of Art. The Downtown Cambridge association sponsored an exhibit and film screening in early February celebrating Globe, attended by former owners Joe and Frank Cicero and MICA printmaking staff. It was fascinating to hear their stories and to know their incredible work will be preserved. House Industries, based in Yorklyn, Del., hosted a hand-lettering workshop in November. House Industries — House began as a type foundry and became one of the world’s top design firms, creating campaigns for Jimmy Kimmel, Green Day and Nickelodeon, among others. In 2017, we visited The Henry Ford museum in Dearborn, Mich., just to see its exhibit on the rise of House. 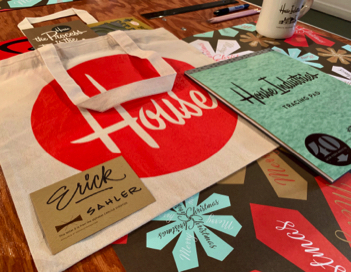 In November, House offered a day-long hand-lettering workshop at its Yorklyn, Del., “headquarters.” What a treat! Indispensable knowledge was shared by House’s Ken Barber and Andy Cruz, who are some of the friendliest guys you’ll ever meet. In addition to revealing their lettering tricks, they made us all feel at, well, home. Wicomico Public Libraries — There are a lot of things I pay for that I don’t need. But one thing I desperately need that I don’t pay a cent for is the local library. I check out dozens of books each month. Just this year I’ve studied up on the Apollo program, Andrew Wyeth, Thomas Eakins, Edward Hopper and Edward Gorey. I’ve read multiple novels by Richard Russo and Rachel Joyce. I’ve listened to music by Jack Johnson and Elton John, and I’ve listened to stories by Garrison Keillor. The online reservation service is a godsend, but I also enjoy regularly perusing the stacks. I always find a couple surprises and leave happy. So thank you Wicomico Public Libraries. I am grateful for all you provide. Andrew Wyeth’s home and studio in Chadds Ford, Pa., is open for tours from April to November. Brandywine Conservancy — The paintings of Andrew Wyeth have always intrigued me, for his technical skill, of course, but also his subject matter. Wyeth toiled his entire career — some seven decades — painting the ephemera of the rural countryside surrounding his homes in Pennsylvania and Maine. 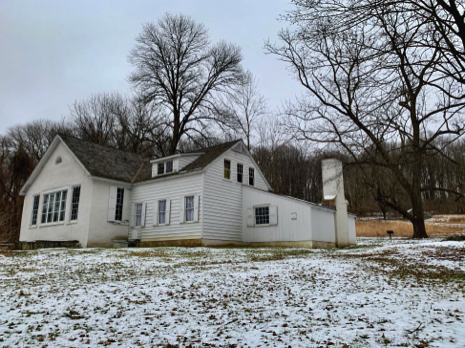 Since his passing in 2009, the Brandywine Conservancy has acquired three Wyeth landmarks in Chadds Ford, Pa. — the homes and studios of Andrew Wyeth and his father, illustrator N.C. Wyeth, as well as the nearby Kuerner farm featured in many of Wyeth’s paintings. In addition, the Farnsworth Museum has purchased the Olson farm in Cushing, Maine, also featured in numerous Wyeth pieces, including the iconic “Christina’s World.” They are now open to the public, and we plan on visiting all four sites in the months ahead. You — Your support allows me to do what I love. Thank you.